Four years after the Refugio Oil Spill, Santa Barbara Channel drilling platforms remain in an awkward state of suspended animation. So do their crews. Before a ruptured pipeline transporting oil from the offshore platforms to processing plants crippled the region’s oil production, ExxonMobil employed more than 300 workers and contractors. Now its three Gaviota Coast platforms ​— ​Heritage, Harmony, and Hondo ​— ​as well as its onshore processing plant at Las Flores Canyon have only a handful of people performing basic upkeep. Many workers were laid off. The rest either agreed to move or are making grueling commutes to Exxon sites all over the world. They want to come home. Their best hope right now lies in a pending permit filed by Exxon in September 2017 to restart the platforms and, rather than wait for the broken pipeline to be rebuilt, use trucks to move the oil by highway to inland refineries. Environmental and community groups are resisting the proposal with arguments that Santa Barbara should be shuttering oil operations, not restarting them, and that the trucks pose a risk to drivers and any neighborhood they pass by. Exxon points out that over the course of six months in 2016, under an emergency permit granted after the Refugio oil spill, more than 2,500 tanker trucks hauled over 400,000 barrels of stranded oil from Las Flores. There were no accidents. Hardly anyone noticed. The company is also quick to note that it wasn’t their equipment, but a pipe operated by Plains All American Pipeline, that caused the spill. Soon, Santa Barbara County regulators will decide on the trucking application. One of the first big steps in their deliberations will be the release of a draft environmental report examining the potential impacts of the proposal. 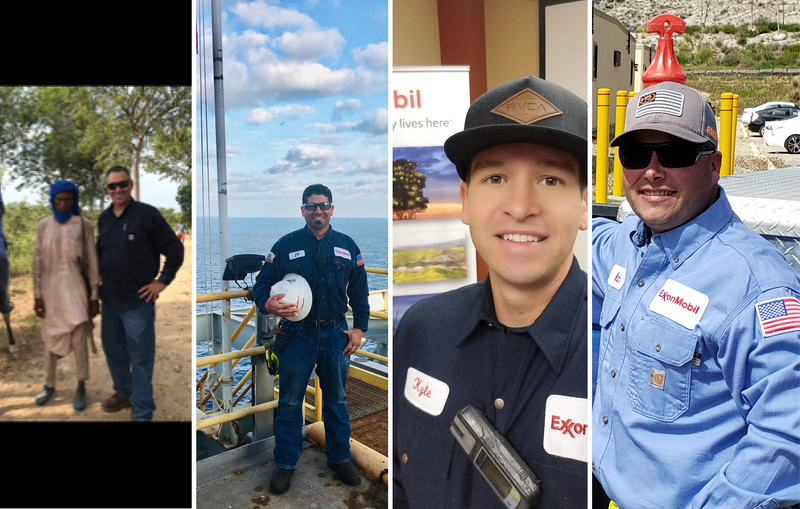 On the eve of its publication, the Independent spoke with four Exxon workers who have more than their fair share of skin in the game. In the blink of an eye and the break of a pipe, Brian Johnson went from performing predictive maintenance on all three ExxonMobil platforms ​— ​a position he’d held for seven years after working his way up from diesel mechanic ​— ​to overseeing a crew of Chadian oil workers in Central Africa. “It’s been a tough transition,” Johnson said. He didn’t have much of a choice. Johnson couldn’t see uprooting everyone to Africa, so now he “commutes” to his office every 28 days by way of Los Angeles, Paris, and the capital of Chad, N’Djamena. The trip takes around 35 hours, which Johnson has to do on his days off. “It means less time with my family,” he said. The constant time changes make for brutal jet lag on both ends, and it’s difficult jumping in and out of his wife’s and sons’ lives. “I show up and try to keep up the momentum, or I take my wife’s place so she gets a break,” Johnson said. “I have to fit in somewhere.” Relatives step up to help, but both Johnson and his wife are feeling the strain on their relationship. “And teenage boys are rough,” he said. In the meantime, Johnson takes every chance he can get to travel with his family to Lake Nacimiento, one of their favorite getaways. “We’re doing our best to make it work,” he said. Collett grew up in Arroyo Grande and started working at Las Flores Canyon (LFC) in 2012. Before that, he was a journeyman sheet-metal worker and serviced heating and air conditioning equipment, sometimes for ExxonMobil. He admired the pride and professionalism of its shops. “I decided that’s where I wanted to work.” Shortly after Collett was hired, he and his girlfriend bought a house in Atascadero. She worked for the Santa Maria Police Department, and he commuted. he spill happened two days after their wedding. “Picture yourself at your wedding. You’re having one of the best days of your life,” Collett said, “then just as you’re about to leave for your honeymoon, boom! Everything changes.” Collett was given 48 hours to accept a transfer offer to Wyoming. He and his wife agonized over the decision. Their whole lives were on the Central Coast. But for Collett, who doesn’t have a college degree and struggled with the inconsistencies of construction work, the regular, healthy paychecks from ExxonMobil were too critical to give up. Ultimately, Collett sold their house, his wife quit her job, and they made the move. Soon after, they had a child. Since 2013, Linares had commuted to Santa Barbara from his home in Whittier. After the spill, he was offered the chance to stay with Exxon and relocate to the Hoover-Diana platform in the Gulf of Mexico. But rather than force the whole family to move ​— ​his wife has a good job as a registrar at Whittier Christian High School, and the kids are now in their teens, a tough time to transfer ​— ​Linares decided to stay in Whittier and make the 10-hour commute to the Gulf every week. “It’s a long day,” he said. It’s always been the goal to get back to California, Linares said. For a while he was carefully tracking the trucking permit process. After a year and a half of waiting, it finally got to him. “I was starting to worry about it too much,” he said. “My wife is already stressed enough as it is, so I gotta be the one to tell her we’re okay, we’re going to get through it.” Linares hopes good news comes soon, but the longer he goes without hearing from corporate, the more his optimism wanes. He laments the effects of the uncertainty on his kids. The move to Torrance, though, put a lot of pressure on Gallegos’s relationship with his girlfriend, who’d recently given birth to their baby girl. “I was working a lot of hours at Torrance, and the stress of the move and everything ​— ​it just wasn’t working out,” he said. “We ended up splitting up.” Gallegos has since moved to West Hills, and his ex is in nearby Simi Valley. They share custody. Gallegos’s job, however, is temporary, unless ExxonMobil can secure the trucking permit. “We really want to get this permit,” he said of coworkers in a similar boat. “We’re really excited about it. We’re a bunch of younger guys who plan on working the rest of our careers at this facility.” Meanwhile, there’s plenty of work to be done prepping the facilities. “There are a million valves to be turned, and a million safety systems that need to be tested before they’re turned,” he explained.